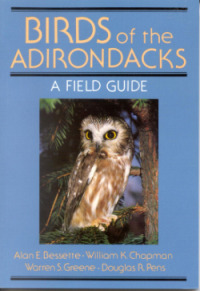 Birds of the Adirondacks: A Field Guide, by Alan Bessette, William K. Chapman, Doug Pens and Warren Greene, 1993. Guide to over 200 Adirondack species with color photos and informative text. Also includes checklist and section on attracting and photographing birds. 240 pp, 5 ½” x 8”.